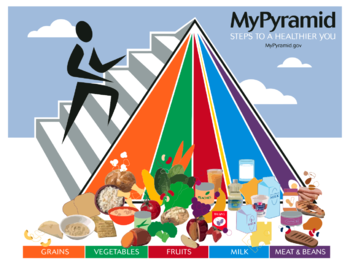 The Food Pyramid is a triangle-shaped diagram of what foods are important to eat and in what amounts as well as and what foods are unhealthy. The Food Pyramid was designed in the 1970s and 1980s by Democratic government officials and the FDA, who hoped to improve children's eating habits by posting the chart in public school classrooms, doctor's offices, and even on TV on funded shows like Sesame Street. The Food Pyramid has bread on the bottom, fruits and vegetables in the middle, and fats and sweets at the zenith. This indicates that even though candy and desserts taste delicious, they are what the designers of the Pyramids called "sometimes food". The inclusion of fruits and vegetables sparked controversy in 1981, when the FDA, acting in concert with the Office of Management and Budget, temporarily reclassified ketchup as a "vegetable" for the purposes of the food pyramid. Public outcry, and opposition from the Reagan White House, caused the FDA officials to recant. This page was last modified on 3 November 2016, at 23:00.